Cooking Lessons, a photo by virithos on Flickr. I took Boo car camping for a weekend when she was a month shy of 3. It was good for all of us. 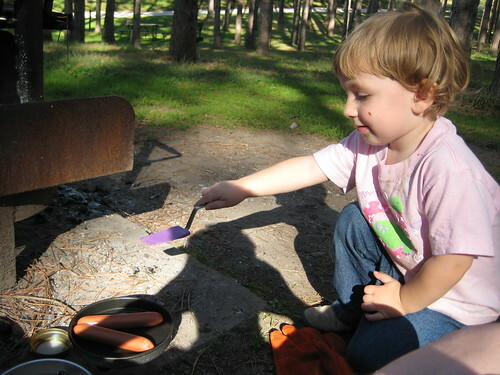 I had to at least let her think she was helping, which was easiest by letting her actually practice helping - she carried things from the car to the campsite, helped set up the tent and bags, and cooked dinner. We practiced important skills - brushing teeth into the grass, using outhouses of dubious cleanliness, identifying poison ivy, stove and wood-fire safety. We watched geese on the lake. We stayed up really late to look at the stars. We made s'mores over the pine twigs available. We generally had a really good time. How much cooking do you let you let your kid(s) do at what age?